This blog is courtesy of Russ Thornton of Wealthcare for Women. I’ve joked before with you about how my job as a financial advisor is as much about psychology, therapy, and counseling as it is about money advice. Because no matter what money advice I give – or that you’re giving to yourself – what really matters is your behavior. And I believe your behavior, both today and over time, is not so much about money as it is about emotions and mindset. 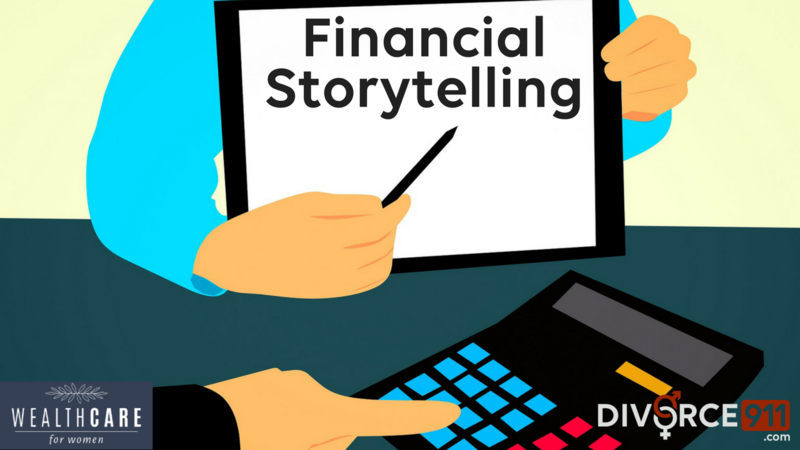 With this in mind, I’d like to share some thoughts on financial storytelling. But first, let me state the obvious. I’m a financial advisor. I am not a psychologist, therapist, or counselor. The following are my amateur-ish thoughts based on 23+ years serving individuals and families as a financial advisor. So, let me ask you an important question . . .
What story are you telling yourself about money? And while you chew on that question, I’ll ask another . . .
Is your money story true? OK, let’s dig into this a little deeper. I’ve written in the past about an “adult money model” that I’ve been tinkering with over the past few years. Based on that model, perhaps you consider yourself an investor but not a planner. Or a planner but not a designer. Or if you’ve ever considered the concept of “money scripts” then maybe you tell yourself – either out loud or quietly to yourself – that you’re a “money avoider” or one of the other identified money scripts. Perhaps you have an altogether different perspective on money and financial planning based on your own experiences or those of others who are close to you. Keep all this in mind, because I want to shift gears here for a moment. Please watch this video which is less than 90 seconds long. In fact, before we proceed, I’d like you to watch it again. Now, think about what you saw in the video. Watch the video once more if it will help you think through what’s going on. The bigger triangle is a homeowner. Smaller triangle is a contractor telling the homeowner all the repairs and improvements that need to be made to the home. The circle is the interior designer outlining all the money that needs to be spent on redecorating the home. The homeowner (bigger triangle) gets frustrated and tells them both to get out. If you’re a parent, perhaps the triangles are parents and the circle is a child or children goofing around and frustrating the parents. Or perhaps this is a domestic abuse story. The big triangle is an angry husband and the wife is the smaller triangle. The circle is a child. The angry dad is yelling at the mom and about to do the same to the child, but the mom grabs the child and gets out of there. Maybe the big triangle is “hitting on” the smaller triangle and wants to date him/her. Thinks they’ll get along because they look similar. However, the smaller triangle has no interest. So the bigger triangle tries to ask the circle out on a date because the circle looks nothing like the triangle. Again, it doesn’t work out. The smaller triangle and the circle wind up together and the bigger triangle is frustrated and alone. Again, the above are just examples of how you might interpret the video. You might have come up with something wildly different. By the way, this video comes from a 1944 experiment. If you’re interested, you can learn more about the backstory here. Or to put it in different terms, which story is right and which is wrong? Perhaps you’ll agree with me that there isn’t a story that’s any more right or truer than another. These are simple interpretations – or stories – we tell ourselves to help us better understand or explain what we’re seeing. As humans, we’re story-telling machines. This dates back to our tribal ancestors who passed information and knowledge from one generation to the next. There was no Wikipedia in the earliest days of human history. I imagine if you were out hunting with others from your stone-age cave dwelling and you happened upon a saber-tooth tiger, your brain told a quick story: run away or get eaten. You probably wouldn’t have pulled out a stone tablet and scratched out a detailed set of scenarios, assumptions, and possible results and then decided how to deal with the tiger. The story you would have told yourself as a cave-man (run or get eaten by the tiger) was likely learned from others or personal experience. Maybe the last time a hunting party went out, one of the hunters didn’t run and was eaten by a tiger. Your “what to do when you encounter a tiger” story was informed by others, personal experience, or both. Likewise, the story you may have seen in the video above reflects who you are and the experiences that led you to where you are today. If you agree that we (and our minds) are natural storytellers, then we, as humans, can easily believe that the story we’re telling ourselves is the reality of our daily lives. The video above is designed to help you experience our natural tendency toward storytelling and hopefully allow you to glimpse what it’s like to detach yourself and your life from your story-based interpretation of your life and the world around you. Perhaps you’ll even begin to give yourself permission to evaluate each experience or event in your life independently and identify what’s actually going on versus the “story” that your brain made up to help you more quickly interpret and deal with your perceptions. And yes, you’re telling yourself a story about money. Some are positive and some may be negative. But the point I’m trying to make is that you control the story you’re telling yourself. If you don’t like the story you’ve been telling yourself about money – or anything else in your life – why not change it up? Let’s take an example of two women. Both are 55 years old. Both have 2 grown children. Both have identical financial situations and resources. And both of them were just served with divorce papers from their soon-to-be ex-husbands. Both of these women have been loving and faithful wives. They’ve both been caring mothers. Both have been stay-at-home Moms for the last 15 years. What do they do when faced with divorce? What story do they tell themselves? Are they going to play the role of the victim and say “woe is me” and never fully recover from this major life transition? Or are they going to deal with it, navigate all the emotions and decision making and get on with living? In fact, I’ve seen both of these very different stories play out in my work with women dealing with divorce. I’m sure you’ve seen or can think of two or more people in similar circumstances or stations in life, but one manages to take charge of her life and make progress toward her goals. Sure she might stumble along the way, and she might even fall down on her face, but she gets back up and keeps fighting to live her life on her own terms. While others in a similar situation seem to be perpetually stuck. And while this can be about money and money decisions, it can also be about your health, your relationships, your career or anything else in your life. I know people – you probably do too – who one day decided they were going to eat better and get fit. And they didn’t just decide it, they actually did it. Several months or a couple of years later, they look like a different person. But they’re not a different person, they just starting telling themselves a different story about what they were going to eat and how they were going to work on their fitness goals. Or you’ve read stories about people who were once flat broke going on to create a thriving and profitable business. There are more examples that I can list here, but I hope you get what I’m talking about. Now, I’m not suggesting that simply by adopting positive thinking, your life will be all rainbows and unicorns. This isn’t about pursuing some unrealistic version of life. Life is hard. And getting harder every day. What I am suggesting is that you can simply tell yourself a different and better story. There are no guarantees that a different or better story will lead to all your dreams coming true. But if you feel stuck, or you can’t seem to get ahead, try a different perspective or story. What have you got to lose?